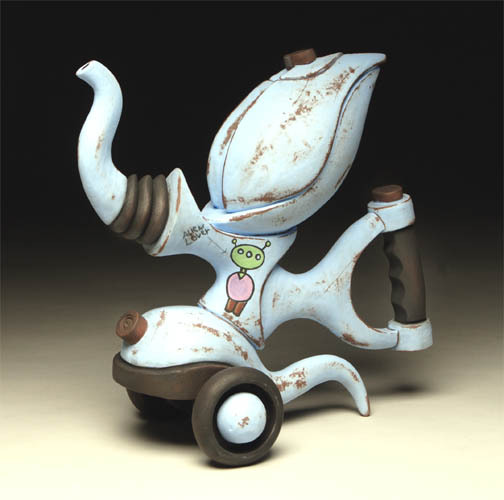 Today I found out that one of my favorite art works, Blue Bug with Tail and Graffiti, was stolen from Concordia University, in Saint Paul, MN, after the 3rd Biennial Concordia Continental Ceramics Competition. A very good contemporary ceramic exhibition that ran from January 28th -February 19th. How am I supposed to emotionally and intellectually deal with the thoughts and feelings that go along with such an occurrence? Three other excellent artists’ works were also stolen. Leopold Foulem’s, the most established of the four of us, has his work in numerous public and private collections. I would be honored to have my work in a collection alongside his, as well as with Keven Snipes and Eva Funderburg’s. I guess I do, because whoever stole this work has a very nice collection of contemporary ceramics, valued at over $12,000. Who and why would someone steal this work? It is not like the average American has knowledge of the art world much less the ceramic art market. The thief or thieves are not going to be able to take the work to local pawn shop and convince the owner to buy these artworks. From my experience people who buy art either have deep pockets or are willing to sacrifice much of their income to surround themselves with art — these are fine, noble, and, rare people. So what is the motivation? Does the thief have connections to the black market? Are they just avid lovers of ceramics and willing to go to such drastic measures to surround themselves with it? Am I honored to be in their stolen collection, I don’t know, maybe I am? Blue Bug with Tail and Graffiti, was one of my favorite pieces. I was keeping it for my private collection, and exhibiting it as NFS (not for sale). I make one-of-a-kind pieces that cannot be reproduced. I might be able to recreate a facsimile of the original, but the nuances can never be recreated. If this pieces is not recovered, and/or not damaged, I am sure that Concordia University will reimburse me for the insurance value of the sculpture. I can definitively use the money, as my studio fund is slowly dwindling, and my wife and I live very close to the bone at the moment. My new series has not been available for public viewing yet, so I am not creating an income. However, money comes and goes, but the artwork of the “Stolen Four” is more important than its monetary value. If it wasn’t, artists would not create, as most of us are rarely compensated for our creative efforts. Art making for the most part is a labor of love and a lot of handwork and perseverance. Most people with aspirations of making a living as an artist don’t, and many stop making art all together. The point being, I would rather have my sculptural teapot back, safe and sound, rather than be reimbursed for its market value. I keep a record of who owns my sculptures. Therefore, it is very surreal and uncomfortable not knowing where my artwork is and who is taking care of it. I have to admit, in a very strange and weird way, I feel slightly honored that someone deemed my work good enough to steel and that it is in such good company. Farewell Blue Bug with Tail and Graffiti, I will miss you! This entry was posted on March 2, 2010 at 5:32 am and is filed under Art, Reflections. You can follow any responses to this entry through the RSS 2.0 feed. You can leave a response, or trackback from your own site.